At the beginning of August I attended the Dorset Food and Arts festival in Poundbury organised by the lovely people of Dorset Food & Drink. A great event which really supports and showcases the talented producers, artists and crafters of Dorset, so I was delighted to be a part of it. 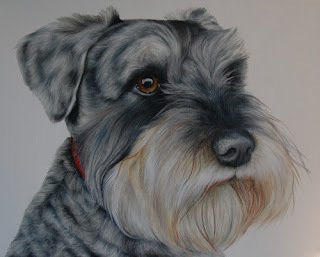 As well as selling my Moo paintings and Kitchenware I was also showcasing my Pet Portraits and got to meet the lovely Marg and Roy, proud parents of Hector the handsome Schnauzer. A week or so after I headed over to properly meet Hector and take a few pics, he was the perfect model and posed like a pro! 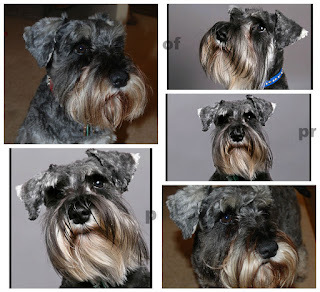 Hector is now the second Schnauzer I've had the joy to capture in a portrait and they really are a great breed to paint. Not only do they have a wonderful personality and unique characters but they also have amazing colours and textures in their fur, making the painting challenging but enjoyable. Roy and Marg kindly headed over to the farm to pick up the painting, Hector came too but was on his way to the hairdressers so stayed in the car to avoid all the mud! They were more than happy with the finished piece and have very kindly recommended me to one of their friends which is a wonderful compliment.